Whalesharks are one of the most sought after big animal encounters in the world. There are many areas in the world with regular whaleshark encounters: The Galapagos, Mexico, and the Philippines to name a few. Did you know that Indonesia is also one of the best places to encounter whalesharks? The whaleshark is the largest fish in the ocean. It’s not a fish I hear you say? It’s true, whalesharks are a cartilaginous species of shark, not an air breathing mammal. Although they rival many whales in size, the whale shark is actually a fish. What they do share in common with many whales though is their huge appetite for the tiniest creatures in the sea. Despite being able to reach almost 20 metres in length, whalesharks feed almost entirely upon microscopic shrimp and other plankton. Whalesharks are often spotted at or near the surface feasting on blooms of planktonic food sources. Although more commonly found as individuals, whalesharks can also be found in groups where food is in rich supply. A rich food supply is why Indonesia is a Whaleshark Hotspot. The great thing about the majority of whaleshark populations in Indonesia is they are usually found in small groups. Areas such as Tomini Bay, Triton Bay, and Cendrawasih Bay are known for “year round” populations of whalesharks. What keeps these sharks in the area? A constant supply of tiny bait fish and shrimp. For decades, local fishermen have fished at night using lights and large nets to attract all kinds of fish. 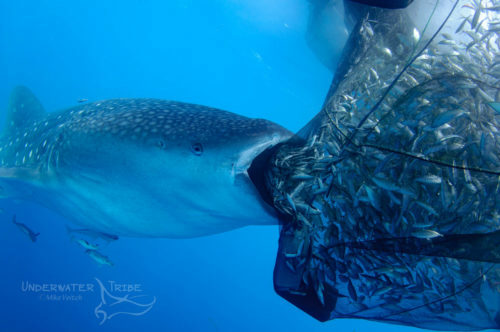 In turn, large numbers of whalesharks have been attracted to this “free lunch” and have fed around the periphery of this fishing industry. 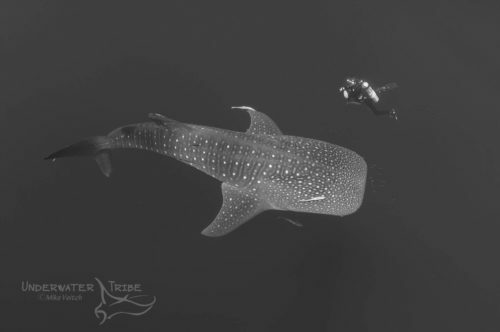 Of course, where whalesharks are, divers will soon follow. Although fishermen have been encountering whalesharks throughout Indonesia for decades, it’s only in the last 10 years that divers have caught on. There are a few special places in the archipelago where it’s possible for divers to encounter sharks in a relatively consistent fashion. We won’t list the exact places here but suffice to say, there are areas throughout the country boasting sizable populations of these giant sharks. Whalesharks are currently listed on the IUCN as an Endangered Species. Their population has plummeted in the last few decades due to fishing, by-catch, and boat collisions. 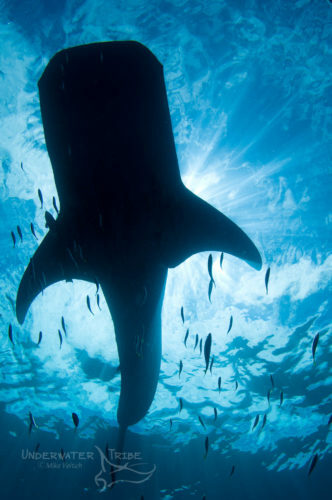 In 2013, Indonesia declared the whale shark a protected species. 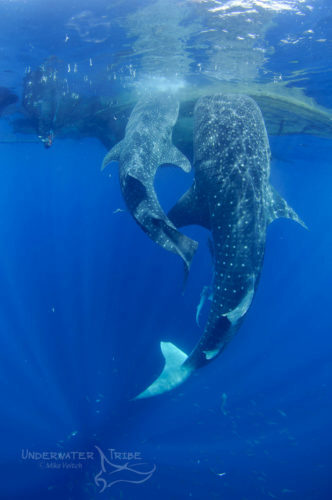 Whaleshark tourism is one way to improve the plight of these gentle giants and protect them from over fishing. The tourism industry is a great alternative to traditional fishing as a way for people to earn a living through sustainable means. This is currently a goal of many conservation initiatives in Indonesia, creating a sustainable tourism industry to support the protection of these animals. Want to Encounter a Whaleshark? We are happy to say that we will soon be hosting a whaleshark excursion. Due to a consistent population of these fish all year round, Indonesia is one of the best places to swim with them. With Indonesia being such a large country, there is always a location where the season is perfect for these encounters. They are found throughout the year as they are virtually resident in their home ranges. The only thing to consider is moon phase, it’s hard to find whalesharks around the full moon. Are you interested in diving with these incredible animals in 2019? Stay tuned to our website or send us an email to get on our mailing list for an upcoming trip.